The Wine Route of Halkidiki starts at Agios Pavlos, moves on to the Kassandra, Sithonia and Mount Athos peninsulas and crosses the mountainous areas of Halkidiki, stoping at Arnea, before reaching the sea at the resort of Olimpiada in the east. The peninsula of Halkidiki lies ahead with its three branches that sink into the Aegean sea, the peninsulas Cassandra, Sithonia and Athos. The vines are cultivated in the central Halkidiki area (Agios Pavlos - Nea Kallikratia), at the middle branch, Sithonia and at the eastern one, Mount Athos. At Agios Pavlos the vineyards are spread in low hills. They abut on the sea which counterpoises with its aura the extreme summer temperatures. The varieties cultivated are Roditis, Sauvignon blanc, Xinomavro and Cabernet Sauvignon which produce the Vins de Pays de Halkidiki: a bright, fruity, vivid white wine and a deep colored, rich and round red.Continuing along their way, visitors should not neglect to visit the Petralona cave, where the skeleton of the most ancient man in Europe was found, the Archantrope, who lived there 700.000 years ago. Visitors will enjoy fresh fish and delicious sea food at the taverns in the nearby sea resorts. Sithonia, the middle peninsula of Halkidiki, is filled with picturesque small ports, sand beaches, verdurous landscapes and offshore settlements. 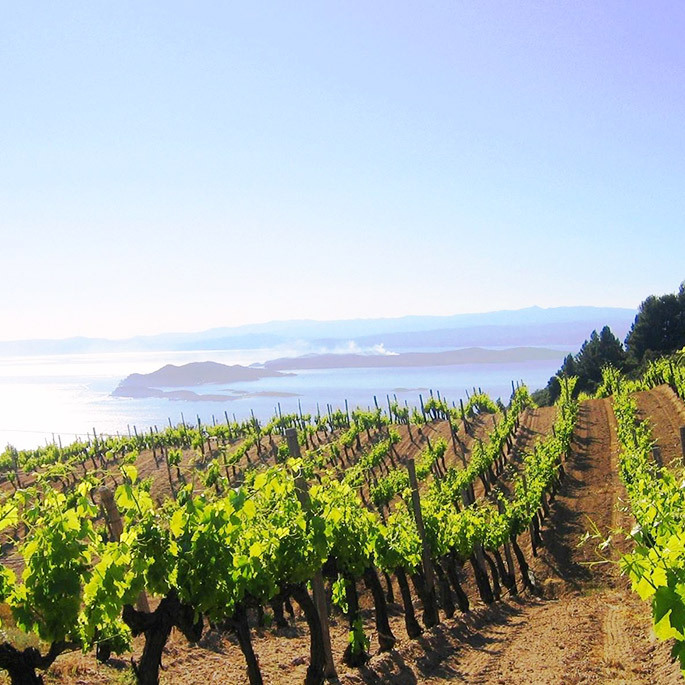 The vineyards are located at Porto Carras, on the sunny slopes of Mount Meliton. The region’s dry climate and the beneficial moisture of the sea are in favor of producing selected wines. The red, deep colored, velvety tasted wine SLOPES OF MELITON (Appellation of Origin) which is produced through the combination of the Limnio, a variety known at least since the times of Aristotle and the French varieties Cabernet Sauvignon and Cabernet franc. A white wine of a pleasant freshness SLOPES OF MELITON (Appellation of Origin) is produced by combining three Greek grape varieties: Roditis, Assyrtiko and Athiri. Visitors will encounter crystal waters, golf and tennis courts, horses for horse riding, mountain bikes, yatchs for sailing and water sports facilities. Worth visiting is Parthenonas, a beautiful mountainous village which was abandoned from its inhabitants during the seventies but is reborn nowadays from the pioneers who have bought and restored its stone houses showing preference to the mountain’s healthy climate, quietness and magnificent view. Then again, at Neos Marmaras, visitors will come across many fish taverns that lie down their carreaux tablecloths on the sand almost reaching the waves, serving deliciously grilled fish and refreshing wine. At the eastern peninsula of Halkidiki lies Mount Athos. There is a long lasting wine making tradition in almost all the monasteries of Mount Athos. Today, there is a wide variety of grapes cultivated at the vineyard: Roditis, Athiri, Assyrtiko, Limnio, Xinomavro, Cabernet Sauvignon and Grenache rouge. In this blessed land with the mild climate, the efficient sunlight, the mountainous freshness and sea moisture are produced two Vin de Pays Agioritikos, a pleasant fresh white and a fruity rose. The Chromitsa Vineyard by Tsantalis Winery and the Mylopotamos Winery are the wineries - members of the Wine Producers Association. Further north, in the picturesque town of Arnea, the brand new winery of Claudia Papagianni awaits wine lovers for a tour of the wine making facilities. The route then passes through traditional mountainous villages, makes a stop at ancient Stagira, birthplace of Aristotle and ends at Olimpiada, a beautiful seaside resort.